Gearóid Mac Lochlainn on life in ‘Illies’ area of north Donegal in the 19th century. The Illies is a rural area in Donegal’s Inishowen Peninsula. Located north of Derry city, Inishowen is almost the most northerly tip of Ireland. By the 19th century it was a society sharply divided between landlords and their tenants. The predominant settlement pattern was of small villages of farm houses (clachans) whose people farmed the surrounding land in partnership on an openfield system and grew mainly oats, barley and flax. As fields were not enclosed transhumance was practiced whereby livestock, which was the main wealth of the people, was driven to mountain pastures during the growing season. The English who established a presence in Inishowen in 1600, reported that the Illies area was mostly uninhabited, except for summer pasture. Inland mountain pastures often belonged to coastal townlands and hence we have the Mintiaghs known as the “Barr of Inch”, Meendacalliagh as the “Barr of Luddan” and Meenyanly as the Barr of Muff (“Barr” being the Irish for “top”). There were only a few tracks crossing the area as most transport was by pack-horse. However by the time the Tithes Roll(1829) and the first Ordnance Survey maps were produced in the 1830´s things had changed dramatically. A road had by then been driven through the Illies and the ladder farms established similar to what they were at the beginning of the 20th century although the field patterns were not as yet fully developed. 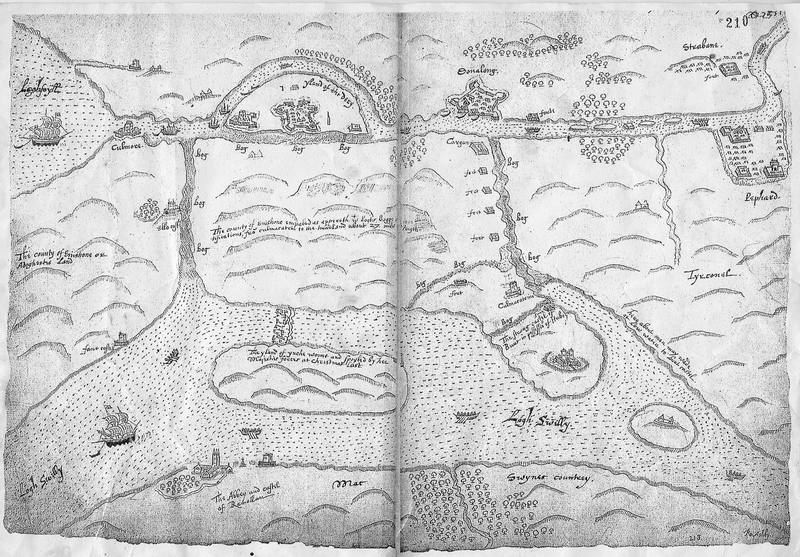 It would seem that the Illies along with Evishabreedy was summer mountain grazing for the Mac Lochlainn, whose territory lay along the Foyle around Redcastle and Whitecastle, and as such at the plantation of Inishowen was confiscated and granted to Chichester who then leased them to George Carey along with the other townlands of the territory. (3) The dispossessed families from the more fertile Foyleside townlands had to move to less fertile lands and pay a rent to the planters. Always strapped for cash to fuel their lifestyle the Chichester custom of demanding an initial heavy down-payment and a relatively low yearly rent for lease of properties prevented smaller farmers from bidding for those leases so that middlemen (often Derry business people) who were able to pay the sums demanded got control of the land and then sublet the small farms at ever higher rents. (4) In some places there was a second layer of middlemen and resulting rack renting caused great hardship for many farmers. Even when smaller holders could afford the leases a difference was made between Catholics whose leases ran to 31 years and Protestants who got 61 year leases. The tenants had no encouragement to make improvements on their farms as such would only lead to a rise in rent. Bog reclamation did not take place because the landlord kept for himself the right to rent out moor for turf cutting. (5) By 1800 most small farmers were tenants-at-will and rents rose steeply, often doubling, in the next 15 years, due to the high prices being offered for barley to supply the demands of illicit distillation. The descendents of George Carey lived isolated from their Irish tenants, the fruits of whose labours they enjoyed to the full, socialising and marrying within the small circle of English-descended families. They were no less fond of the good life than their overlords, the Chichesters, and so by the end of the 18th century their expenditures far outstripped their income with the result that they were obliged to mortgage parts of their estate and eventually put the whole up for sale in the Court of Chancery. (6) The Illies and Evishabreedy remained in possession of the Careys until at least 1819 when they are mentioned in an indenture of sale to Simon Rose of that year. (7) By the time of Griffith’s Valuation (1857) they had both passed into the possession of George Harvey. 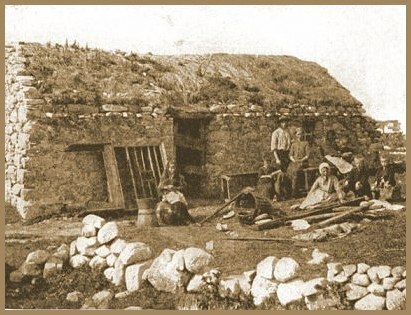 A poor family in 19th century Donegal. Although he never married Robert had at least four sons and three daughters. When he died his title passed to his nephew by his half brother as all his own children were illegitimate but they did however inherit his properties. Curiously although the eldest son, Robert, and descendents who inherited Langley Park continued to use the double barrelled name, though often reducing Bateson to its initial, the others styled themselves simply as “Harvey”. The second son, William Henry, had entered the church and after serving as curate in various parishes was in 1821 appointed rector of Crowcombe, Somerset, where the family had a large estate. (12) After his father’s death he inherited the Inishowen property and so in 1827 he resigned his rectorship (13) and moved to Desertegny where he built a large residence known as Linsfort House at a cost of £3000 (forty years later a house in the Illies with its accompanying outhouses could be built for under £30). The Batesons were ultras Conservatives – opposed to Catholic Emancipation and extension of the franchise. Brother George who now inherited the property had no intention of living in Ireland. In 1844 his cousin, Thomas Douglas, brother of Sir Robert Bateson, 2nd Baronet of Killoquin who had inherited his father’s title, was acting as estate agent and living in Linsfort House. He was one of the witnesses who gave evidence to the Devon Commission on the state of agriculture in the Buncrana area. Shortly afterwards he took up employment as agent for the Templetown Estate in Castleblayney where his harshness led to his murder in 1851. He had earlier evicted 34 families leaving 222 people sitting without shelter on the roadside. This was not the first time that he had run foul of his tenants because 10 years previously a plot to kill him had been uncovered in Co. Donegal. (20) He admitted in his evidence to the Devon Commission that the tenants complained of exorbitant rents. After his departure from Inishowen George handed over the management of his properties to the ruthless estate agent, John Millar, who took up residence in Linsfort House. This man carried out George’s bidding with the utmost cruelty and an example of his work appeared in the Derry papers of 1849 when Nancy Mc Laughlin was evicted from her home in Leophin. Evictions were common in the late 19th century. “On January 14 several evictions were carried out on the estate of R.B. 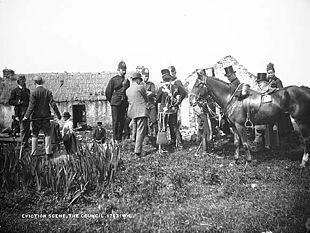 Harvey by the under sheriff of Donegal accompanying whom were 7 cars of police under the direction of Mr. Harvey R.M. and M. Winder D.I. These evictions were quite unexpected as but the previous week the tenants waited on the agent seeking an abatement and though they got no great encouragement they expected he would communicate with the landlord, who is credited with being a fair man, and thus secure for them reasonable terms. The sheriff and party were in the village of Clonmany at an early hour and ready to begin operations shortly after 9 o´clock a.m. The first house visited was that of widow Ellen Doherty, Tullagh. The occupants of the house consist of her and daughter, her only son having gone to America about a year ago, being unable to live on the farm which is exceptionally high rented. The second person who was fated to go through the trying ordeal of being turned out of the home of his forefathers was George Mc Laughlin, Urrismenagh. The family numbers 7 persons and though the poor man offered to pay 3 half year´s rent it was rejected by the agent. The bailiffs, who met no resistance, soon cleared out the house and it was a sad sight to see the poor fellow sitting by the roadside with his family around him, the big tears rolling down his cheeks, whilst he looked at the agent nailing up the door with his own hands. The third family visited consisted of 2 unmarried girls, one of whom is extremely delicate. These tried to make a settlement offering the agent all they had in the world, as they said, but to no effect; the bailiffs were ordered to do their work which did not delay them long. Harry Mc Daid’s turn came next. This man ought to be quite familiar with the sheriff and party having received a visit from them on 2 previous occasions. He has a wife and 6 young children and they all lived in a little house of about 10 feet square right up at the foot of Baughter. The operation of clearing out the house was more unpleasant than laborious. Small and uncomfortable, however, as the place was the poor fellow would not be allowed to remain there though having paid twice over in rent the value of the rood of stony ground which he had made out of the mountain side; not a man in the world would give the law expenses for the holding. The fifth case was perhaps the most heartrending of all. Widow Grace Gibbons is the tenant before whose house the word of command is given to the little army to halt. The particulars of this woman’s case furnish an instance of the unfortunate occurrences that have made it impossible for landlord and tenant to live in harmony in this country. This woman lost her husband by his efforts to pay the rent. Returning home from a mission of this nature a most tempestuous evening came on and the poor man was blown off the road into a large pool from which he was extricated with difficulty but died soon afterwards from the effects of exposure. The woman has 5 little children, all girls, and is most destitute. When I was a small boy I used to spend all the time that I was allowed in the Illies and I remember one evening on the street in front of the house trying to squeeze the last drops of sunlight out of an autumn day my grandmother saying to me “ a heskey, look yer al wetshod. Come in out a the caul afore John Millar gets ye”. Of course I had no idea who John Millar was nor do I think had she but it shows how terror of the man lingered on in the minds of the people long after he had departed the scene. Robert died later that year (1887) and his second son Major Charles Bateson Harvey now inherited the Inishowen property. He married Catherine Maria Lascelles in 1891 but he was killed in 1900 in the Boer War. Three years later the Irish Land Act was passed and the Harvey estate was sold in her married name although individual farms were being sold off at least 6 years earlier. It should come as no surprise that the people of Inishowen, as in the rest of Ireland, took measures to protect themselves from the abuses of these landlords and so secret societies were formed to fight back known as Ribbonmen or Molly Maguires. Some secret societies set up to resist landlords prey just as heavily on the local population. However as often happens with such organizations control falls into the hands of local thugs who prey on tenants rather than protect them and such was the case with the group in this area known as the Cleenagh Men because as the local doggerel says they held their meetings “behind a ditch in Cleenagh”. Many stories of their exploits are recounted and it was said that if a man brought a young heifer worth £5 to a fair in Buncrana and was offered £3 by one of these thugs he would be well advised to accept it for fear of what might happen to himself or his family otherwise. In 1896 the position of work mistress in Kinnego School became vacant. Cassie Blieu from Ballymagan applied and was appointed over the daughter of one of the gang members. Obviously this did not go down well and a campaign of terror was organised against parents of the pupils with the aim of getting them to boycott the school. When this did not succeed four masked ruffians broke into the Blieu home one dark night and unmercifully beat the family with stout sticks causing serious injury to the father and sons and then before leaving smashed the windows and doors. The eldest son, Charlie, never recovered and suffered a total mental breakdown. He had recurring panic attacks when he showed signs of extreme terror and on occasions became violent. The family sought to have him committed to an asylum but out of pity did not proceed with their intent. On Sunday 14th. March 1897 while his two sisters were at Mass Charlie was seized with a fit of terror and in his insanity attacked with a beetle the members of the family in the house at that time killing his father, Robert, and rendering unconscious his mother, his brother Willie, who had been sick in bed for some time past, and a little niece, Rose Callaghan, who was eight years old. As he struck his victims Charlie uttered the words “God bless you”. He then tried to cut his own throat. Later when restrained but still in a dazed state, he declared “that’s the rear of the Cleenagh men”. This was not the only tragedy to befall the Crana area in the 19th century. In 1865 news of the Foyle Disaster stunned the whole area. The disaster occurred on Saturday 16th September 1865 at 3:25 P.M. on Lough Foyle between Whitecastle and Quigley’s Point, as a result of the collision between the steamers Garland and Falcon. The former left Derry at about 2:00 P.M. with a cargo of livestock and some 50 passengers on her way to Glasgow. It was a clear day with calm water. In 1865 17 men drowned aboard a boat on Lough Foyle on its way to Glasgow. There was plenty of sea room and yet she struck the Falcon on the port bow with subsequent loss of life. The latter was on her way to Derry crowded with Irish reapers returning from the Scotch harvest. After the crash the two vessels separated and it was observed that a number of reapers were in the water. It seems that in their panic many of them rushed for the lifeboats fearing that the Falcon was about to sink. As the 19th century progressed the whole appearance of the Crana valley changed as it did elsewhere. The Irish villages were gradually broken up by the landlords through evictions and the houses splattered over the countryside to create the landscape that is now considered typically Irish. Thomas Douglas Bateson, in his submission to the Commission says “The whole barony was in rundale not long ago. I subdivided the estate which fell out of lease into farms proportioned to the rent which the rundale tenants formerly paid, locating the stronger families up towards the hills”. 5 Information extracted: a)from the Devon Commission April 1844 submissions by Rev. E Mc Ginn No. 166 and Mr Samuel Alexander No. 167; and b)the Ordnance Survey Memoirs for parishes of Clonmany, Desestegney, Donagh and Mintiaghs. 6 Joyce Cary Remembered: in letters and interviews by his family and others. PP 6 and 7. 7 PRONI The Cary Papers. D2649/5/3. 8 Irish and Scottish Mercantile Networks in Europe and Oversees in the 17th and 18th Centuries by David Dickson, Jan Parmentier and Jane H Ohlmeyer. PP 276 -279. 9 The Hillhouse family of Irvine, Scotland and Dunboe/Aghanloo c.1600-1750. P 9, note 63. 12 New Monthly Magazine 1821, vol. 3, Ecclesiastical Promotions, P 365. 13 On line: “View Career Model Record for Harvey, William Henry. 14 Ordnance Survey Memoirs. Parish of Desertegney. 17 Enquiry into the condition of the poorer classes in Ireland (Civil Bill ejectments P256 Nos. 560 and 583. 23 Internet> Papers Past – New Zealand Tablet- 1887 Irish News> Evictions in Donegal. 24 The Derry papers (Journal and Standard) 15th and 17th March and 19th July 1897. 25 The Derry papers (Journal and Standard) 20th and 23rd September 1865. 26 “Sacsa nua darb ainm Éire” (A new England called Éire) is taken from Fearflatha Ó Gnimh´s 17th century poem “Mo Thruaighe mar táid Gaoidhil” (Pitiful the Plight of the Gael) in Measgra Dánta, Miscellaneous Irish Poems, Part 1, T.F. O´Rahilly, editor, Cork University Press/Educational Company of Ireland, 1927. 3 Responses to "The Illies and its environs in the 19th Century"
A great read. Many thanks. Like yourself, in my youth, I spent many, no, every, Summer in the Illies, Though, to see the sun set we had to go up to Rep and up there too to see the sun dancing in the morning. The sounds of the grouse calling over in the Cuts in the evening, Mary Ann Duffy next door and the Kaiser passing on his bicycle, Wee Willie John and the way the Widow Man’s would fill up with people, off to Mass on a Sunday morn in the back of Dan Kelly’s van, gathering ‘Dimlick’ Roe’s spuds, setting night lines and gather bilberries. The oven pot scone baked over the turf fire. Was there ever a food that tasted so well? So many happy memories. https://www.youtube.com/watch?v=lBLoC5TYDGo the old homestead as it is today, bereft of life. No granny, no Sarah, no Gingle, no Cassie, nor wee Frank. No looking out of the bed to the fire in the room as the rain battered the tin roof and we’ be going to the Glen Hole in the morning to fish after we dug the worms in the duhil. Breidge above is a Mc Daid. My granny was a Folly Mc Daid. What a great article.Nancy McLaughlin from Leophin who was evicted from her home was an ancestor of mine. Her daughter Biddy was badly injured by the bailiffs. No one seems to know what became of the family.